The very elusive tiny firm of Ardex dates back to the period between the wars. In 1934 they offered a cyclecar in the Morgan idiom, but with smaller motors with displacements of up to 500cc. In 1937 a four wheeler with a streamlined body was on offer, and it was the cheapest car available on the French market at that time. After the war, a new small car emerged from the tiny workshop in Nanterres , now under the company name of Ardex, as opposed to the prewar Automobiles Ardex.. 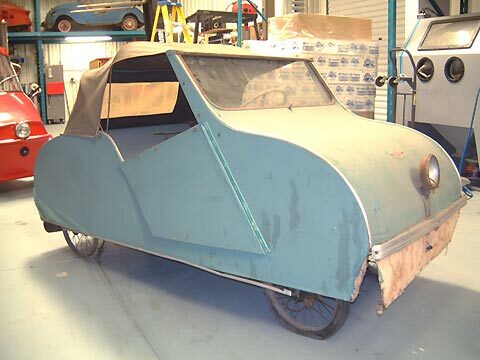 This microcar had the most basic bodywork made of plywood covered in vinyl.. The four-seater version had engines by Saab of 100 or 125cc. The two-seater version, the Museum example, was smaller, and had a 50cc motor with an interesting dash-operated clutch/ drivetrain arrangement. Production of all cars from 1934 to 1937, and again from 1952 to 1955, was extremely limited. Car demonstrations at the Nanterres shop were limited to Mondays and Saturdays only!